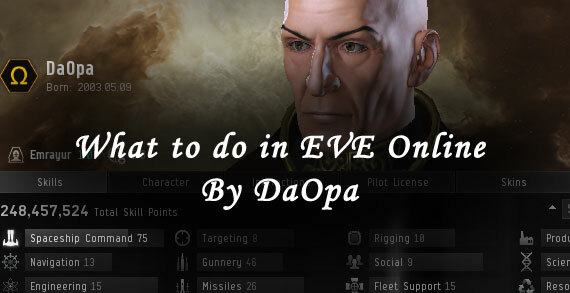 What to do in EVE Online? This will be a overview guide on the many different paths and careers you can do in EVE Online. Its a work in progress and I will be continually updating as new options are available. Scout areas for enemy moments and activities. Infiltrate enemy corps and alliances, become a member and earn trust. Sign into their forums and gather all intel possible. Get a cloak on your ship and go spy on enemy operations hidden from sight. Sign up to one of the faction militia’s corps and hunt down opposing factions players. Relationships are key to holding a alliance together, be the agent that makes the back room deals. Lead a fleet of other pilots for various objectives. Be part of fleets guarding sov space or areas your corp members accompany. Fight with your alliance to protect your coalition or to conquer other areas of space. Entosis Operations – specialized in the task of entosising during sov related event timers. Hang around gates waiting for possible targets to attack. Use high dps ship to target other ships before concord police kills you. Hold another ship or pod hostage and requesting ISK to be transferred over in order to be let go. Stealing items, wreaks, loot from other players. Optional level 4 security agent missions, high difficultly rating assignments, may be declined with no standings loss. Series of missions that follow a story split up in chapters. Research missions that prove a small amount of research points, which is used to buy datacores. Use Data analyzer to hack containers for components, blueprint copies, skill books and more. Use relic analyzer to salvage the derelict ships and other floating objects for tech 1 / 2 salvage components. Rare cosmic signature sites with a maze of trouble, but rewards storyline blueprint copies and other rare components. Hidden combat pockets of pirates which will have a greater chance for more valuable items and blueprint copies from commander spawns. Timed mini hacking sites, get in fast, hack what you can and get out before reinforcements show up. Due note, on failure to successfully hack the container will cause aoe damage which scales depending on sec. Hidden gas cloud sites, bring a venture with gas mining skill to harvest these clouds in order to make boosters. Travel to asteroid belts and hunt down npc pirates. Hunt down npc miner ships with friends at asteroid belts, destroy the hauler and get a chance at a strong box with loot inside but be careful of the reinforcements. Requires fleet, teamwork to repel pirate incursions. Lore Events that spawn engagements in all known space. Requires fleet and teamwork, high isk per hour if you are able to find a seasoned group that runs these all the time. Requires fleet and teamwork, more risky due to being in low / null sec space but also greater chance at unique blueprint drop. Mapping systems and creating chains of data in order to navigate thru wormholes. Setup a citadel and create a base of operations. Special wormholes with planets that are all destroyed. Special wormholes with drifter spawns and unique hive complexes. Create citadels with components / pi products. Boosters are performance enhancement drugs, use resources from gas harvesting to make these items. Buy Blueprints, Research them, create copies for personal, corp or for selling to others. Buy items from Trade hubs and move them to hotspots in different regions for a mark up. Buy items based on assumptions of future changes to resell at a later date for a markup. Use the jump drive to travel long distances into deep space. Accept courier contracts and move goods to required places. Planetary Interaction, the extraction of resources from planet surfaces. Factories can also be placed on planets to convert base planet resources into products of various tiers. Join other corporations to form alliances, their is strength in numbers. EVE’s Lore is very extensive, roleplay a character in the ever changing landscape of the lore. Broadcast your adventure on one of the many live stream platforms.